Classic and compact, the Oliver Oak Stool Grey Fabric is a perfectly pastoral piece designed for both traditional and modern spaces. The Oliver Oak Stool gives a timeless bar stool design a contemporary edge, and is sure to add panache to your interior. Gorgeous grey fabric covers the generous square padded seat, and is enhanced by grid stitch detail, giving a soft and cosy feel to its backless design. Strong and sturdy, the solid wooden frame has four light oak finished legs that come complete with integrated protective floor plugs. Reinforcing bracing bars form practical footrests, and the fixed height design is perfect for use at the kitchen worktop or island. 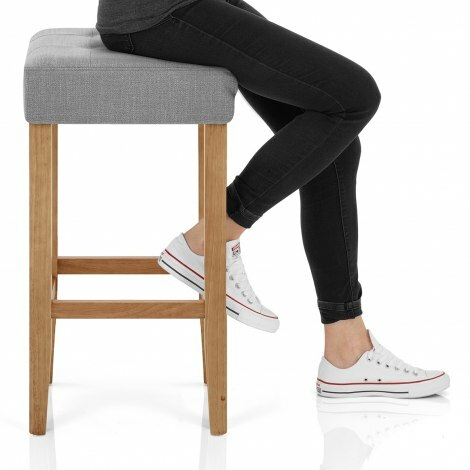 "Fab service, gorgeous product, excellent packaging"
Excellent advice given, very prompt delivery, very pleased with the quality of the stools, and the overall appearance. 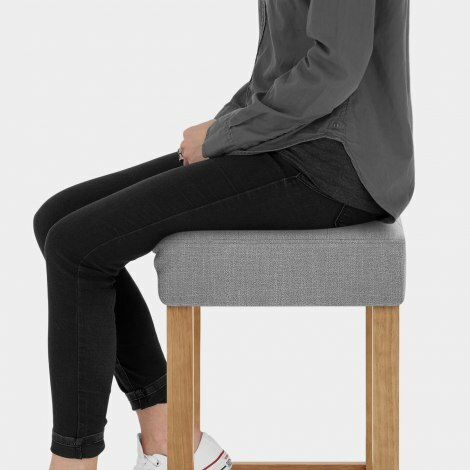 Been looking for stools for our oak breakfast bar for ages and these are perfect. Great height for standard kitchen worktop/breakfast bar, sturdy, solid construction, very easy to assemble, great quality, lovely fabric and very comfy to sit on. Much admired already and a great value price. Next day delivery brilliant too........definitely recommend. 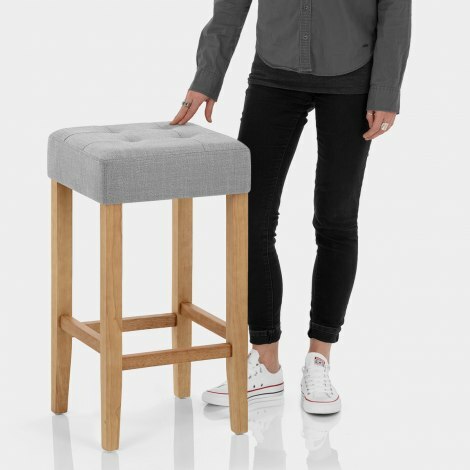 Having just had my kitchen completely renewed I was looking for a stool for my breakfast bar and found the perfect one. This stool is not only the right height but the wooden legs match my worktops and the grey fabric was exactly what i was looking for - a great success all round. Love these bar stools. Just as advertised and so far appear sturdy,comfy and good quality. Fab service, gorgeous product, excellent packaging, not one thing missing and would definitely use this company again!